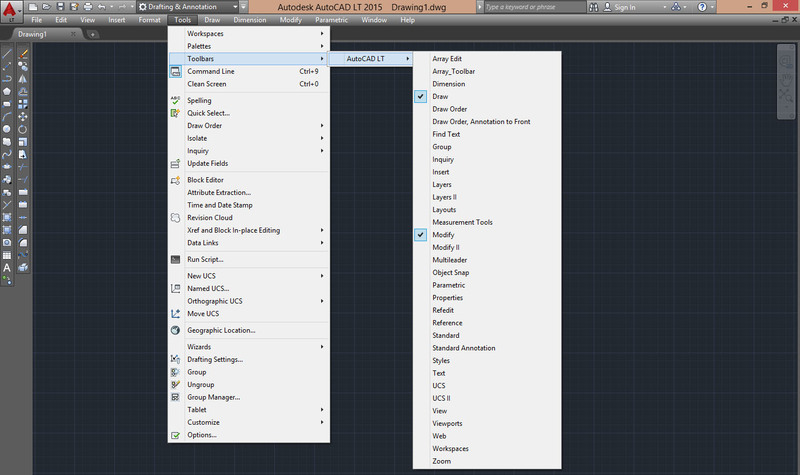 We have seen that over older versions, for several years now have been grouped commands of AutoCAD in a "ribbon" which includes several groups of commands that were previously included in the various "toolbar" of the classic interface. In each of these settings, when we go with the cursor over one of the buttons, titles or tabs, these will expand showing all its commands. - In the menu bar go to "Tools" > "Palettes" and click on the item "Ribbon". This way you disable the ribbon. The entries in this menu correspond to the various "toolbar" visible and invisible, and as you have already understood, from here you can enable or disable it. Then click on the items "Draw" and "Modify" to make these toolbars visible. If appear in the drawing area you can be moved it by clicking and hold on, to their left edge and dragging them (one at a time) on the left side of the screen, at some point you will see that it will automatically become vertically, at this point release the left mouse button. Now to activate additional toolbar, simply click with the right button over any toolbar already open and will open the pop-up where it can activate or deactivate other toolbars. In this way, you can customize the program interface as you want, by activating the toolbar that you use frequently and placing them where you want, to the right, to the left, at the top, or on the drawing area. 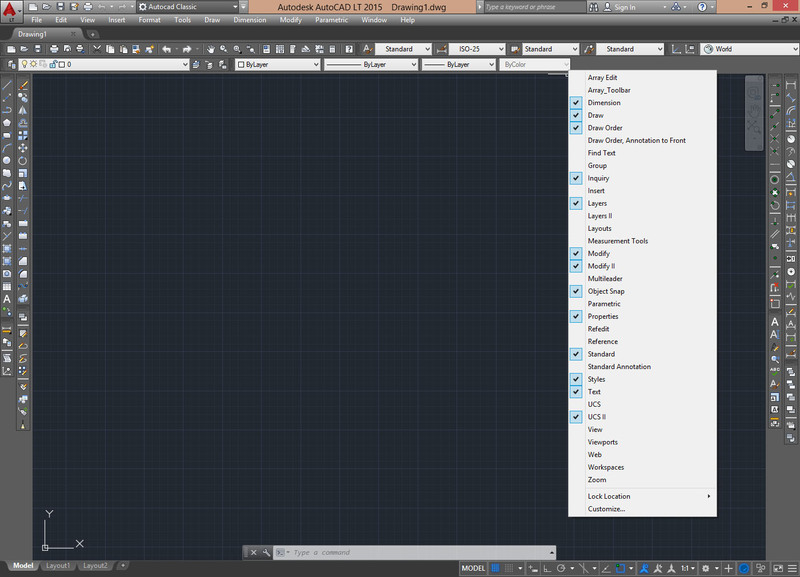 Following an example of AutoCAD LT 2015 with custom interface and the toolbars places in the “classic” style of the program. From the pop-up list, you can see that have been activated. After setting the interface, you can save it to reload if necessary. Then type the name you want and click OK, as you see I have called “AutoCAD Classic” and if necessary, it can be load from this menu.